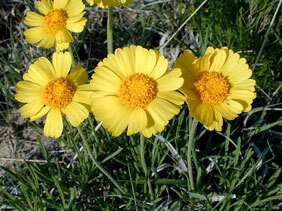 Also Called: Plains yellow daisy, four-nerve daisy. Leaves: Basal, simple, sessile or short-stalked, closely overlapping, nearly erect, linear to linear-lanceolate, 1 to 4 inches long, less than 1/4 inch wide, glabrous or sparsely hairy; margins entire; axils densely woolly. Inflorescences: Heads, solitary, terminal, on rigidly upright flowering stalks, about 1.5 inches wide; bracts in 2-3 series, to 1/4 inch long, thin, silky. Flowers: Ray florets 8-21, to 4/5 inch long, yellow, prominently 4-nerved; tips 3-lobed; disk florets numerous, corollas yellow. Fruits: Achenes, less than 1/8 inch long, dark, tipped with 5-8 short scales, enclosing small seed. Habitat: Dry, open, rocky or sandy, limestone sites. Distribution: West 1/2 of Kansas. Comments: Blooms in May and June and sometimes again in September. After maturity, the ray flowers droop, turn whitish, and become paper-like. Plains hymenoxys can form large mats with abundant heads.